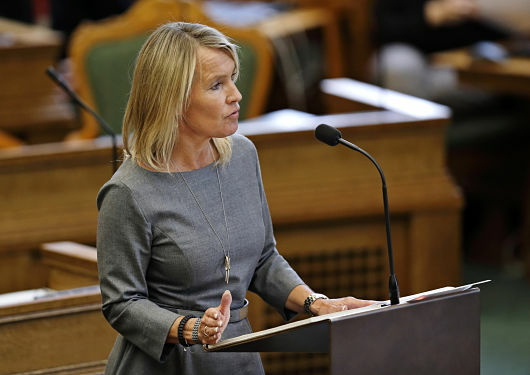 On June 18, Denmark’s center-left government, the Social Democrats, were ousted out of the political limelight as the country moved dramatically to the far right in favor of the ring-wing, populist and anti-immigrant Danish People’s Party (D.P.P). The Danish People’s Party is often regarded with stigma both at home and abroad, and is on the outskirts of Danish politics since its founding in 1996. However, in the most recent elections, the D.P.P. came in second place with 21.1% of the votes, only 5.2% less than the number of votes received by the leading Social Democrats. According to preliminary results published by the DR.DK, Denmark’s national broadcaster, the center-right bloc that includes the D.P.P now holds a majority of 90 seats in Parliament, which, for the first time, has elevated the D.P.P. into the centerfold of Danish politics. The results of this election come on the heels of growing unrest within Denmark over issues related to immigration and the security of the Danish welfare state. Denmark, a socialist and uber-liberal country which was voted “happiest country in the world” last year, is one of the highest-functioning welfare state programs in the world. The thanks is owed to the Danish citizens paying the highest income taxes in the world, at 60.2%. The Danish welfare state was created in 1933 following the Social Reform Act, which sought to redirect Denmark’s attention inwards following the loss of the last remnants of the former Danish Empire, which once included Southern Sweden, Northern Germany, Iceland and Norway (and continues to include Greenland and the Faroe Islands). A “Denmark for the people” mentality was adopted, which subsequently iterated outwards into a Scandinavian-socialist ethos which has traditionally regarded foreign aid as an obvious centerpiece of Danish foreign policy. Providing welfare services “from the cradle to the grave” for citizens at home, such as free childcare, education through university and healthcare, and providing international aid to citizens abroad was regarded as two sides of the Danish-socialist-mentality coin. The recent elections reflect the ways in which some Danes have begun to adjust their thinking about the welfare state and its relationship to those outside the “Danish family.” Similar to the recent wave of anti-immigrant parties which have popped up throughout Europe, such as the Finns Party in Finland, the Progress Party in Norway, the Sweden Democrats in Sweden and UKIP in the United Kingdom, the D.P.P. frames itself as the voice of “Old Danes” who regard the growing influx of immigrants within Denmark as a threat to the Danish welfare state and the Danish way of life. The presence of immigrants in Denmark, who make up around nine percent of the population country-wide, in conjunction with the recent surge of 14,000 mostly Muslim asylum seekers and the Copenhagen shootings of February 14 by the 22-year-old son of Palestinian immigrants, has produced a backlash of growing nationalist sentiment in Denmark. As a result, supporters of the D.P.P. have begun to implicitly redefine how “Denmark for the people” is understood. A motto which traditionally went unchallenged, given the historically monocultural and monoethnic nature of the Danish population, is now being reformulated by the D.P.P. to function more as “Denmark for the Danes;” as the D.P.P. has proposed slashing welfare entitlements for newly arrived immigrants and refugees into the country. Increasing exclusivity regarding Danish welfare state benefits is being matched in Parliament by talk among the D.P.P and the Liberal Party that Denmark should cut back on foreign aid in order to channel more money into welfare entitlements for native Danish citizens, especially the elderly. In 1970, the world’s richest developed countries agreed to give point seven percent of their Gross National Income (GNI) annually to international development aid. Historically, Denmark, along with Norway, Sweden, Luxembourg and the Netherlands, has been one of the few developed countries to actually commit to reaching this target. Proposals or talks of cutting foreign aid thus represent a dramatic break from Denmark’s historically extraordinary commitment to reaching the point seven percent goal. A survey conducted for the Ministry of Foreign Affairs has also found that right-wing political opinion about foreign aid is being matched in public opinion, as support among Danes for foreign aid has fallen by 15% in the last five years. The recent shift to the right in Denmark now leaves Sweden as the only country in Scandinavia in which the center-left continues to hold the majority of political power. The Swedish equivalent to the D.P.P. – the Swedish Democrats – also continue to be regarded as political pariahs in mainstream Swedish society. Despite Denmark’s sudden swing to the conservative anti-immigrant right, the country currently continues not only to meet, but to exceed, the annual point seven percent foreign development aid target. Earlier this month, U.S. Representative Matt Salmon of Arizona introduced a bill to prohibit any government agency from contributing to the United Nations Population Fund (UNFPA) on the grounds that the organization isn’t in line with America’s policy agenda. The bill, H.R. 2678, is the fourth bill introduced by Salmon as a part of his “Shrink Our Spending Initiative,” a budget plan to cut what Salmon has deemed “wasteful taxpayer-funded programs.” It is also the second bill of its kind to go before Congress in the last 5 years. “Taxpayers shouldn’t be forced to fund activities that aren’t in line with our national priorities,” said Salmon, calling the UNFPA a “pro-abortion organization,” according to a SonoranNews.com report. But according to the United Nations Population Fund FAQ page, the UNFPA does not promote abortion as a method of family planning. Rather, it works to promote family planning measures such as the use of condoms and female birth control. However, the organization does work to address the impact of abortions on women’s health, and to assure that in nations where abortions are legal, it is safe and accessible. Learn why the military is requesting that Congress better fund efforts to combat extreme poverty. The UNFPA operates as a subsidiary of the United Nations General Assembly to address population and development issues. Started in 1969, the United Nations Population Fund now operates in 150 countries, and has been instrumental in reducing the complications of pregnancy and childbirth in developing nations. Sexual and reproductive health problems are the leading cause of death and disability for women in developing nations, and according to the UNFPA, some 225 million women lack access to family planning measures. The goal of the United Nations Population Fund is to assure that all women have access to safe and effective family planning measures and safe deliveries, and to make sure that every pregnancy is wanted. In 2013, the United States was among the top 10 core donors to the United Nations Population fund, contributing nearly three percent of the UNFPA’s total contributions for the year. If H.R. 2678 passes, it will eliminate all government contributions to that total. The bill regarding United Nations funding was first introduced on June 4, 2015 and has been referred to the House Committee on Foreign affairs. According to a Huffington Post report, the Committee has already approved a $150 million cut to family planning and reproductive health programs. Such program cuts may jeopardize the health of an estimated 225 million women in developing countries who lack access to safe family planning, according to Huffington Post. Wondering how the two Democratic presidential candidates match up in terms of foreign aid support? As always, foreign policy is one of the key issues in the upcoming election. But perhaps in this election, a key focus will be put on foreign aid, rather than the military. Overall, Clinton and Sanders both voted to support foreign aid bills. The only exceptions – Clinton not always voting and Sanders rejecting emergency aid bills. Both Clinton and Sanders are solid in their support of foreign aid. According to an article by One.org, Clinton strongly stressed that U.S. foreign aid is an investment. As for Sanders, a concern is that he will avoid voting for aid to any organizations that register or tax American guns. Who is My Senator? I have lived in Los Angeles my entire life, yet only recently did I become aware or even conscious of who my senators are. Barbara Boxer and Dianne Feinstein are currently the two women who represent the State of California in the 114th Senate, and both women have dutifully served the American people since before I was born. Boxer is a Democrat and was elected to the Senate in January 1993, after serving in the House of Representatives for ten years and on the Marin County Board of Supervisors for six years. Boxer is not only an active representative for the State of California, but is passionate about the environment, defense and foreign policy, women’s health, gay rights, civil rights and many other issues. Some of the issues she’s voted for include restrictions on gun possession, increased minimum wage, increased taxes for the wealthy, women’s right to get an abortion, expanding ObamaCare, and an easier path to citizenship for illegal immigrants. In November 2010, Boxer was reelected to her fourth term in the Senate. Feinstein is also a Democrat. She has made many advancements in legislation for protection of the environment and natural resources, increased national security, prohibiting assault weapon prevention and various health-related legislation. Feinstein strongly supports a woman’s right to have an abortion, legally requiring employers to hire women and minorities, marriage equality, stricter punishment to reduce crime rates, creating an easier pathway to citizenship for illegal aliens, increasing taxes for the wealthy, prioritizing green energy, and staying out of Iran. On the other hand, Feinstein opposes expanding the military, gun ownership, vouchers for school choice, privatizing social security, and keeping God in the public sphere. Both Boxer and Feinstein boast long lists of awards and accomplishments from their combined years of service in both the Senate and in other government bodies. If you want to know more about who your senators are and what they represent, click here. http://borgenproject.org/wp-content/uploads/The_Borgen_Project_Logo_small.jpg 0 0 Clint Borgen http://borgenproject.org/wp-content/uploads/The_Borgen_Project_Logo_small.jpg Clint Borgen2015-06-23 10:41:492017-03-20 14:25:41Who is My Senator? George Bush: The former Republican president is well known for his AIDs relief work in Africa. While in office, President Bush signed the President’s Emergency Plan for AIDS Relief. The program significantly increased access to antiretroviral drugs on the African continent, saving millions of lives. That effort set the stage for his post-presidential humanitarian work with First Lady Laura Bush through the George W. Bush Institute. Located at the Bush Center in Dallas, the organization promotes global health and human rights through a variety of programs. Through the Pink Ribbon Red Ribbon initiative, for instance, the president and first lady are working to reduce deaths associated with cervical and breast cancer in the developing world. Bill Clinton: Following his presidency, Mr. Clinton sought to address humanitarian issues worldwide. The Bill, Hillary and Chelsea Clinton Foundation has quickly become a cornerstone in the fight for improved global health, economic development, gender equality and environmental protection. Founded in 2001, the Foundation includes a wide range of humanitarian endeavors. The Clinton Health Access Initiative, for example, works to improve healthcare infrastructure, while the Clinton Development Initiative stimulates economic growth by increasing access to financial services for entrepreneurs in the developing world. The Foundation also has a strong track record in promoting the well being of women and girls across the globe. 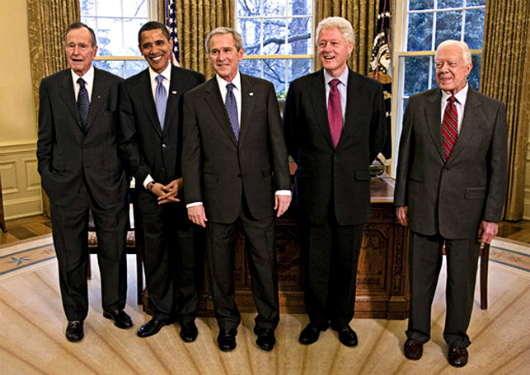 George H. W. Bush: At 90-years-old, George Bush Sr. is the oldest president on this list, besting fellow nonagenarian Jimmy Carter by a few months. The elder Bush shows no signs of slowing down though; he’s gone skydiving on his 80th, 85th and 90th birthdays, and leads an active life. The president has been just as active in promoting public service through his Points of Light organization, which encourages volunteerism worldwide. The network boasts 250,000 service projects every year across 30 countries. That adds up to 30 million hours of volunteer service each year. Jimmy Carter: President Carter has had many roles in his life: peanut farmer, Governor of Georgia, President of the United States—but he has perhaps found his great success as an international humanitarian. He is one of four presidents to receive a Nobel Peace Prize, but the only one to do so after leaving office. Most of his efforts have involved The Carter Center, which was founded in 1982 and takes “Waging Peace, Eradicating Disease, Building Hope” as its motto. The Center has targeted a wide range of diseases, including guinea worm, river blindness, trachoma and lymphatic filariasis. Thanks to the president’s efforts, the prevalence of guinea worm disease has been reduced by 99.99 percent since 1986. Belo Horizonte, the third most populous metropolitan city in Brazil, is one of the most progressive actors in poverty reduction. Home to nearly 2.5 million, Belo Horizonte practices the Right to Food that perceives food as a human right rather than a commodity. Poverty rates have dropped dramatically in Belo Horizonte since policy makers enacted this act in 1993. Certainly no policy goes without a financial cost—the Right to Food law calls for a 10 million dollar yearly budget. While seemingly large at first, this amounts to two percent of the overall budget of Belo Horizonte. Policy makers have established budgetary committees to foresee the maintenance of this budget in accordance with the economy. This novel distribution of funds has proven successful, largely due to the positive returns the Right to Food law has enabled in the job market. The effects of the Right to Food law in Belo Horizonte are immeasurably positive for the future of poverty reduction. To ensure food distribution, Belo Horizonte implements affordable food stations that act as restaurants around the city. People of all walks of life, ranging from low-wage workers to businessmen, eat at these restaurants. This social integration eliminates the shame behind hunger and promotes a culture where everyone is deserving of food. The Right to Food law is an award winning policy and serves as an inspirational example of how food redistribution saves lives. UNESCO named the Right to Food law, Best-Practice in 2003. The Right to Food law also received the Future Policy Award by the World Future Council in 2009. Belo Horizonte did something the U.S. has yet to do, tackle poverty from a bottom-to-top approach. By recruiting the help of local farmers, Belo Horizonte helped the impoverished by teaching them ways to help themselves. Policy makers isolated the detrimental effects of competition in the market and eradicated them, thereby emphasizing the freedom in free markets. The Right to Food serves as an example of the role democracy can play in helping the world’s poor. When voting for your congressional leaders, it is important to know where they stand on certain issues. By knowing their stance, voters are able to make informed decisions when they flock to the polls. Being aware of both Democratic and Republican views also provides a certain amount of accountability to the politicians. Often times when politicians campaign, they include a lot on their platforms that will get them elected. However, if constituents continually call, email and write their politicians about issues that concern them, they ensure a certain amount of accountability to those who got them elected. Here are five quotes from Republican political leaders that highlight their views on world poverty and global health. · Benjamin Franklin, Benjamin Harrison, Thomas Johnson Jr., John Dickinson and John Jay all made up the very first committee. · The House Committee on Foreign Affairs has had many different names throughout its history, some include: originally the Committee of Correspondence, then Committee of Secret Correspondence, and even more recently, the Committee on International Relations. · There are six subcommittees currently set up within the full committee. · There are a total of 44 members; 25 Republicans and 19 Democrats. · Edward Royce (R) has been the chairman of the committee since 2013, and also the chairman of two subcommittees: Terrorism, Nonproliferation and Trade in Asia and the Pacific. · The House Committee on Foreign Affairs has legislative influence over some very important organizations such as the Agency for International Development (USAID), the Peace Corps, the United Nations among others. · There have been two American Presidents that have been apart of the committee: James K. Polk and John Quincy Adams. · The most recent Oversight Plan of the Committee (January 2015) can be found on their website, it outlines most of the focuses of the committee for this year specifically; some of the focuses include ISIS, North Korea, Foreign Assistance and Human Rights. · You can watch/listen to any of their hearings on their website in order to understand what happens in their decision making processes (http://foreignaffairs.house.gov/). USAJobs.gov is a helpful resource when it comes to finding a policy or federal job. According to USAJOBS, “The Pathways Programs offer clear paths to Federal internships for students from high school through post-graduate school and to careers for recent graduates, and provide meaningful training and career development opportunities for individuals who are at the beginning of their Federal service.” Programs include the Pathways Internship Program, Recent Graduates Program and the Presidential Management Fellows Program. The site also has additional helpful resources that allow users to search federal occupations by college major, look through a comprehensive A-Z list of federal agencies, find an internship, or recent graduate job by a keyword, salary, pay grade, category, location, department or agency. Going Global is committed to providing “grassroots intelligence” through their team of in country researchers. They monitor and update the career information and resources that are delivered to users. GoinGlobal.com allows the user to easily find international jobs and policy jobs. Their website provides country specific career and employment information for 30 countries and its database search allows users to search by country, profession or topic. IO Careers allows users to register for job alerts online, search international organization jobs database and filter the search by organizations, grades, professional fields, and locations, subscribe to jobs, assists students and young professionals, lists federal agencies, provides other employment possibilities. The Partnership goes above and beyond by actually getting involved and challenging policymakers and our government to have quality employees. Their website provides users with ample amounts of resources for programs and services for Federal Management, Federal HR, Political Appointees, Higher Education, Private Sector and Congress. The U.S. House of Representatives can be a great resource for those seeking policy jobs online. This website allows users to see how to apply for various positions within the House as well as employment positions with members and committees and positions with other House organizations. The site also provides information for new employees and information for former employees. The Senate Employment Bulletin is published as a service to Senate offices that choose to advertise staff vacancies. The listing is posted online and revised throughout the week. State employment websites include agencies that conduct studies, publish labor market statistics, and often enforce occupational safety regulations. These agencies process unemployment claims, administer workmen’s compensation programs, handle workplace discrimination complaints, and sometimes sponsor job fairs. This site states that it is “The Official State, County, & City Government Website Locator.” All 50 states are listed on this page with various websites of departments, divisions, industries and employment opportunities, allowing users to skim through a variety of helpful links that correspond with the state of their choice. In a groundbreaking decision in the nation’s post-Soviet history, the Ukraine elections resulted in their first majority pro-European parliament. For the greater part of the last 300 years, Ukraine has operated under Russian or Soviet ruling; the results of the election tilt the country’s diplomatic affairs further away from Russia. Many attribute the dramatic switch to Russian President Vladimir Putin’s elimination of Crimea and Donbas from elections. Those two regions historically have provided a solid pro-Russian vote. However, Crimea remains annexed and Donetsk insurgent controlled, stripping pro-Russian parties of their voting base. Crimea’s annexation didn’t just remove pro-Russians from the voting process, it changed public opinion of eligible voters, as well. 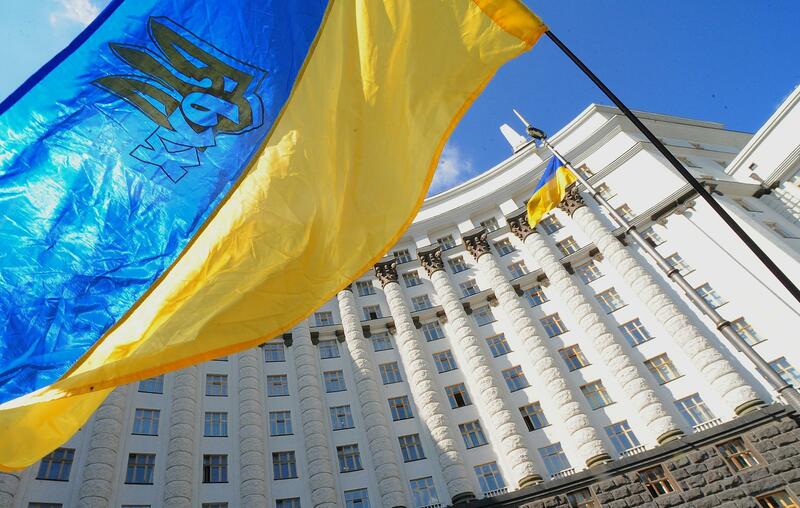 According to a poll by the International Republican Institute, in September 59 percent of Ukrainians favored membership in the EU and only 17 percent in the Customs union of Russia. Just a year ago, those figures were 42 percent and 37 percent, respectively. Exit polls indicated that many voters cast their ballots out of concern that the current parliament was corrupt and incompetent. This monumental shift creates an opportune climate for relations with the EU and the U.S., while presenting great challenges for the Ukraine. According to Daniel Runde of Forbes Magazine, Ukraine will need new trading partners. Twenty-five percent of Ukraine’s energy comes from Russian oil. Russia is now demanding Ukraine pay back its $3.1 billion debts and prepay for future oil supplies. It appears the EU will administer two loans to the tune of $965 million to help cover these costs. This makes clear that Ukraine will need to start exploring alternative sources of energy. Despite the fact that the country still remains very culturally woven to Russia, Ukrainian President Petro Poroshenko says he hopes to join the EU within six years. Many Europeans argue a ten-year timeline is more realistic. Runde argues that more successful ties between western Europe and the Ukraine will require more than political efforts. Culturally mirroring the political shift toward western Europe requires Peace Corps involvement in the Ukraine, more student exchanges between the regions and more western teachers working in the country.